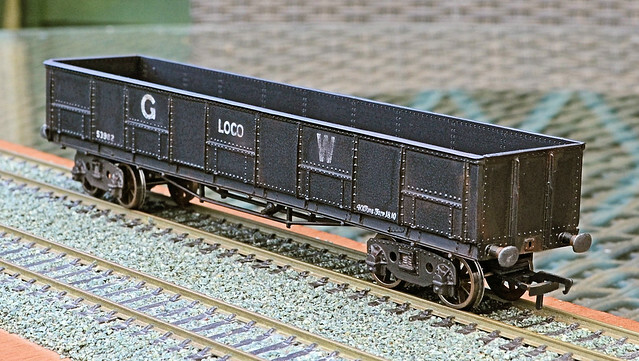 Awaiting coal and some ordered coupling hooks, this 40ton bogie loco coal wagon is a Cambrian kit. Simple enough construction but much cleaning-up of flashed mouldings was needed. Keyser also made a model of this but I have never been able to win one when they occasionally crop up on eBay. The Cambrian kit is an improvement over the Keyser model however. It is very free running however, with wheelsets in brass bearings. The bogies are correct in pattern but extremely flimsy being perhaps a little too thin to be open-ended. Brass units [or white-metal] might perhaps have been preferable. It'll do though. Lettering is by Pressfix, as usual, but unfortunately the appropriate sheet did not contain numeral of the correct size. Consequently, the running numbers are a little small. But who'll notice? I know it's derailed: the wind blew it! Nice quality Job, although I expect that from you. recall if it included buffers ..... probably did. fantastic job, thanks for taking the time to share it. That is nice. It almost looks similar to the brick wagons. This wagon went for a run tonight at the club and when compared to other bogie wagons [eg my recently posted LNER Brick Wagon] it is absolutely huge! Even though too scale, this is a really big item and when coaled will be quite heavy. Nice 'light' job of the weathering on great looking truck. One day, in the distant future, when I finally retire, I will have the job of weathering 1,000 wagons! Is there some clever way to 'rust' the wheels without painting the running surface? Yes! Don't paint the running surface! Seriously, I paint all parts of the wheel except for the treads. I use railmatch acrylic dark rust. Tony how well does the acrylic adhere to the wheels, does it stand up to the odd clashes with the rails when re-railing? I've use acrylic on loco wheels, but that's the first place you put your fingers when trying to avoid the details on the body.